Jay Garmon [dot] Net: What 2 modern game console rivals almost collaborated on a single game system? 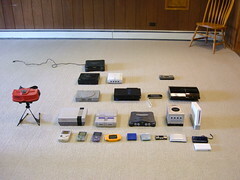 What 2 modern game console rivals almost collaborated on a single game system? Image by Andrew-LGP via FlickrOnce again, I posit a question in the form of Geek Trivia in not one, but tow different formats. You can learn which of the modern console-cranking triumvirate -- Sony, Nintendo and Microsoft -- almost tag-teamed the video game market in efficient text form in my latest Geek Trivia column on TechRepublic's Geekend blog. If you want to auditorially luxuriate with the question, check out my TechTalk radio version of the tidbit, with additional content on Bitcoin, public education and other web-based minutia of interest.